Proper neuronal function relies on precise wiring of axonal projections during development. Axons are guided by extrinsic cues as they navigate towards their final target and are refined by activity-dependent mechanisms to find the proper synaptic partners. We use the visual system to analyze the contribution of each of these factors in the formation of connectivity. Retinal projections form a visual map in their target organized in a topographic and eye-specific manner. This specific organization is crucial for vision and allows to easily map any defects caused by improper targeting. Our aim is to understand how activity and molecules shape the visual map during brain development. We combine mouse genetic methods, in utero and ex vivo retinal electroporation techniques together with cell culture, tracing and histological methods. Fig. 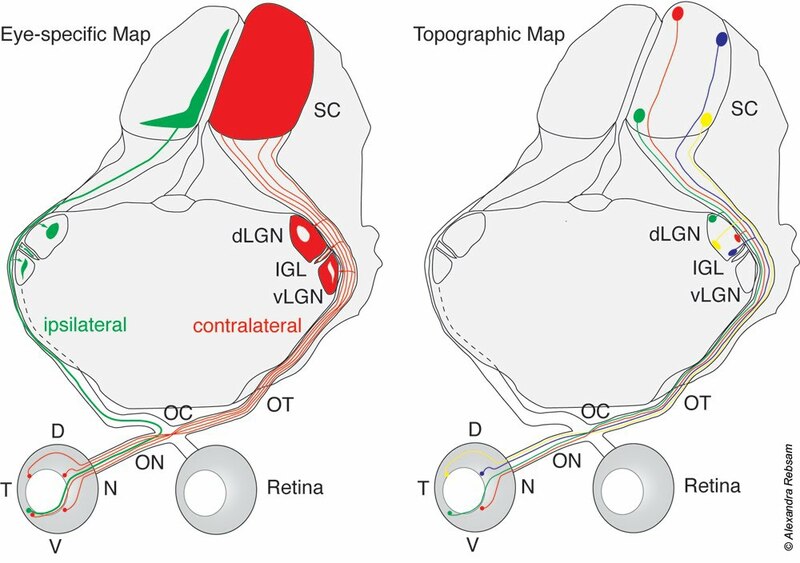 1: Eye specific (left) and topographic (right) organization of retinal projections in mouse visual system. ON: optic nerve, OC: optic chiasm, OT: optic tract, vLGN: ventral lateral geniculate nucleus, dLGN: dorsal lateral geniculate nucleus, IGl: intergeniculate leaflet; SC: superior colliculus, D: dorsal, N: nasal, V: ventral, T: temporal. Within the retina, numerous neuronal cell types integrate visual information, yet only the retinal ganglion cells (RGCs) convey this information to the brain. Retinal axons innervate different brain targets depending on their subtypes. During development, retinal axons grow outside of the retina and form the optic nerve. At the optic chiasm, retinal axons defasciculate and are guided towards the same side of the brain (ipsilateral axons arising specifically from the ventrotemporal retina in mice) or cross the midline towards the opposite side (contralateral axons from all the retina). After the optic chiasm, retinal axons from each eye regroup in the optic tract before projecting to their targets in the thalamus and brainstem (Fig. 1). Within their main targets, the dorsal lateral geniculate nucleus (dLGN) and the superior colliculus (SC), retinal axons organize in a topographic manner and ipsilateral and contralateral fibers innervate distinct regions (Fig. 1). This segregation into eye-specific territory is crucial for binocular vision. The retinotopic organization is crucial for a coherent representation of the external world. Initially, both maps are not properly organized, with ipsilateral and contralateral territories overlapping and retinal axons overshooting their final topographic zone. The eye-specific and topographic maps (Fig. 1) are refined during development through various activity dependent and independent mechanisms. Within the target, guidance cues from the Ephrin family are crucial for the proper formation of retinotopic maps. We aim to identify new molecules that are important for topographic and eye-specific map formation. We focus on the role of Plexins and Semaphorins. Semaphorins are characterized mainly as repulsive guidance molecules. Semaphorins have been implicated in guidance, fasciculation and branching of axons. In the visual system, semaphorins are important for the guidance of photoreceptors in drosophila, of RGCs at the optic chiasm and tectum in Zebrafish and more recently for the laminar stratification of retinal cell neurites in mice. Plexins are transmembrane glycoproteins and the principal receptors to semaphorins. Prior to eye opening and visual experience, spontaneous activity can be recorded in the RGCs. This activity is initiated by starbust amacrine cells and propagated accross the retina and to RGCs via cholinergic transmission during the first postnatal week. These spontaneous retinal "waves" causes neighboring RGCs to fire action potentials in a correlated manner. Pharmacological or genetic perturbations of the nicotinic receptor abolish or perturb retinal waves and leading to defects in map formation, with ipsilateral and contralateral fibers overlapping and incomplete topographic refinement. Many groups have focused on the role of retinal waves and the features of correlated actvity important for eye-specific map refinement, sometimes with strong controversy. We aim to understand whether presynaptic release from RGCs is necessary for eye-specific segregation or topographic mapping and how molecules and activity interplay to form visual maps. The initial role of serotonin on map formation was discovered by studying sensory map defects in a mouse lacking monoamine oxydase A (MAOA), the degradation enzyme for monoamines. In the visual system of MAOA-KO mice, eye-specific segregation in the dLGN is altered and ipsilateral fibers in the SC do not cluster and extend beyond their normal territory. The overactivation of 5HT1B receptors by serotonin excess is responsible for most defects. Interestingly, features of the serotoninergic system are expressed transiently by glutamatergic neurons of sensory systems during development, in particular, in thalamocortical axons and retinal axons. These serotoninergic characteristics include the serotonin transporter (SERT) and the 5HT1B receptor but not the enzyme for 5HT synthesis. Furthermore in the visual system, SERT is transiently expressed in the ipsilateral but not contralateral RGCs located in the VT retina and its expression is regulated by Zic2, the transcription factor specifying ipsilateral identity. We aim to investigate the role of serotonin on retinal axon guidance and targeting, focusing on SERT and 5HT1B. In albinism, affected individuals exhibit a lack or reduction of pigmentation in the eye and/or skin, which is the well-known phenotype of this disease. However, albino patients have several visual defects, particularly a binocular vision deficit, that is due to a concomittant reduced ipsilateral projection. Using a mouse model of albinism, we have previously shown that visual maps are altered in the albino mice and that fewer RGCs from the ventrotemporal (VT) retina project ipsilaterally, reflected in a decrease in cells expressing ipsilateral markers. Furthermore, retinal axons respond differently to a perturbation of retinal activity in albino mice compared to pigmented mice. These results suggest that the defects in afferent targeting and activity-dependent refinement in the albino dLGN arise from RGC mis-specification together with potential perturbations of early activity patterns in the albino retina. We now aim to study these mechanisms to better understand their relevance to the onset of visual defects in albinism.